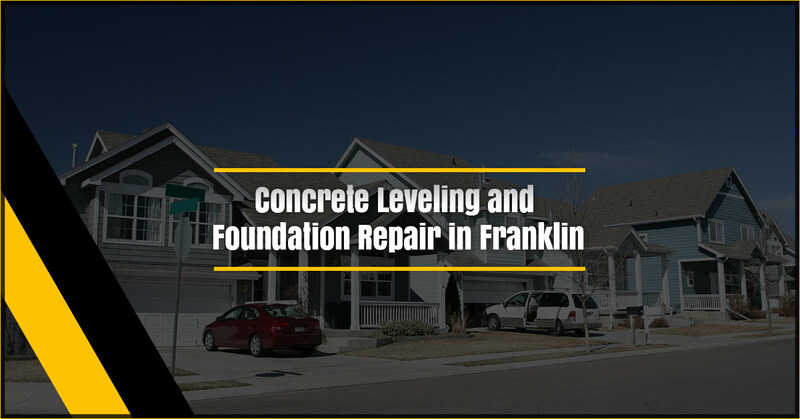 Are you in need of foundation repair or concrete leveling in Franklin? Our team of experts is here to help! For over three decades we’ve been serving the residents of our area with high quality services at prices that won’t break the bank. At the end of the day, we pride ourselves on providing our customers with great customer service and a job well done. As a matter of fact, we can often save you over 80% compared to the price you would pay to replace your concrete outright. It doesn’t get much better than that. We are proud to offer a number of different services to help take good care of our customers. Whether you’re in the market for foundation repair, repairing your concrete or brick steps, floor supports, or sidewalk leveling and repair we can get the job done the right way the first time around. We’ve been rated as the #1 concrete industry franchise by Entrepreneur magazine and since our inception we’ve leveled over a million slabs of concrete. We take our jobs seriously because we know that our customers deserve to have homes and businesses that look great. It’s as simple as that! We love the opportunity to serve the residents of Franklin with concrete leveling and foundation repair services, so if you’re in the market for our help, we would be honored to work with you. We take pride in our ability to communicate well with our customers. That means we can keep you up to date on timelines and make sure you understand the scope of the work we’re doing. To get a free quote, simply let us know a bit about what type of job you have for us and we’ll get back to you as soon as possible. We look forward to hearing from you!